I pulled this album out blindly. I had hoped to just pick one and then have that one be the one I listened to. I’ll try to do that next time, but I really didn’t feel like listening to Dinah Shore this morning. So sue me. This morning is actually perfect for this album. It’s incredibly warm and sweet where the morning is a dull gray. Now, can it hang, would it be topping any charts were it released today? Hell naw. This came from the crooner era, he was one of the last to make it out of that time. There’s a Sinatra cover on it, to give you an idea. So this is an evocative album, it makes me think of a different time, of my mom at age 12. Holy crap, did I do that math right? No way, my mom was never that young! Sigh, not only was she that young, she had better taste than I did at that age. Thankfully my New Kids on the Block tapes are long gone. 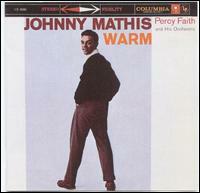 Johnny Mathis, the name was recognizable to me, though don’t ask me to name a hit. Though apparently he’s sold roughly 350 million albums (thanks Wikipedia), which kind of knocked me on the ground. So will I listen to this again? It’s made me consider re-re-reorganizing my record collection. Making a rainy, cozy day section because, yeah, I will listen to this again. It’s as I said above, really warm. I like how it fills my apartment. But to be honest, my mind wandered, yes it’s lovely, but all the tracks are very similar. That doesn’t detract from how nice the album is, there are plenty of today’s albums where broken into pieces, I love, but listening to them in one sitting….nope. Beach House’s Bloom, as an example. I find myself thinking, “didn’t I just hear this song?” So while I will listen to this again, I’ll do it while I’m doing dishes or some similar mundane activity where I like a little background music. Can it hang? – Sure. And for your listening pleasure, my favorite track on the album, a Sinatra cover. I listened to Johnny Mathis when I was 12. Over and over and over again. Sometimes the same song. I am old. 😉 Hi Sap.